I hope I’m not too late to the party. Cauliflower “rice” seems like a big hit among healthy foodies on the internet at the moment. I’ve been meaning to try and finally I made a cauliflower tabbouleh today. Tabbouleh is a Middle Eastern salad normally made of bulgur wheat. Replacing bulgur with cauliflower makes this salad raw, grain-free and also crunchy for days in the fridge. This fresh and light salad is a perfect complement to any kind of protein or with flat bread. Cauliflower is a perfect replacement for the white rice because it looks similar, but has more crunchy texture and better nutrition in it. Cruciferous vegetables (such as broccoli, kale, cauliflower, cabbage, watercress, and mustard greens) are said to be detoxifying because they provide support for the immune, inflammatory, hormonal, detoxification, and antioxidant systems in your body. They also contain powerful anti-cancer compounds unique to this class of vegetables. It is a little messy to make “rice” using a box grater. If you grate too hard, cauliflower goes everywhere on the kitchen bench. So be gentle with that baby unless you want to do a massive cleanup afterwards. I think using a boxer grater is better although it is time consuming because a food processor seems to make “rice” too fine and wet. I will leave it up to you, either a boxer grater or food processor is fine. 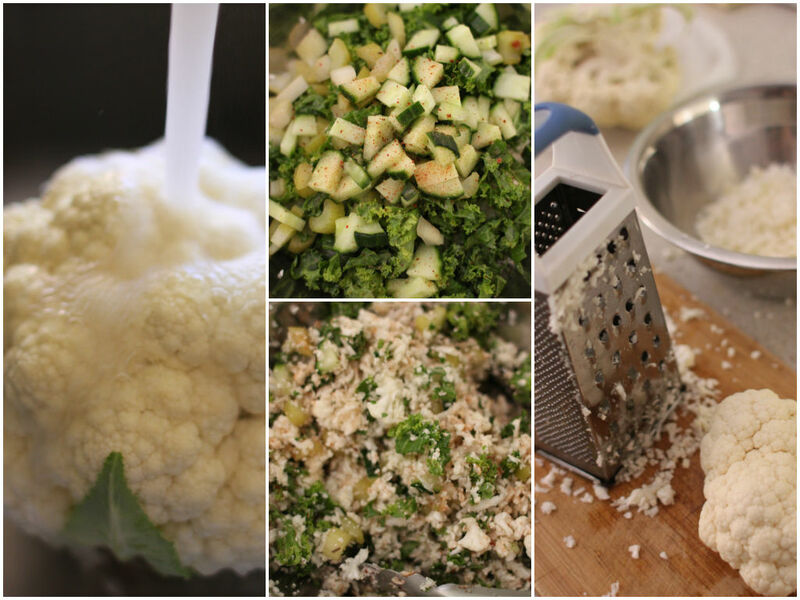 Wash, cut the florests and grate the cauliflower into “rice”. 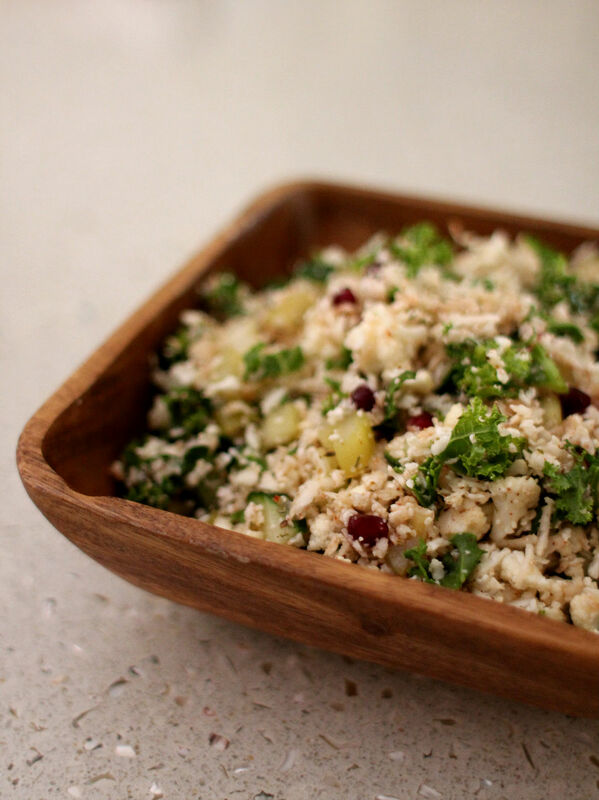 Combine with cucumber, kale, coriander and pomegranate in a large mixing bowl. For dressing, mix all ingredients in a small bowl and stir well. Pour the dressing into the tabbouleh and gently toss. Transfer to a serving bowl.